Last year I was excited to discover Wekiwa Spring. 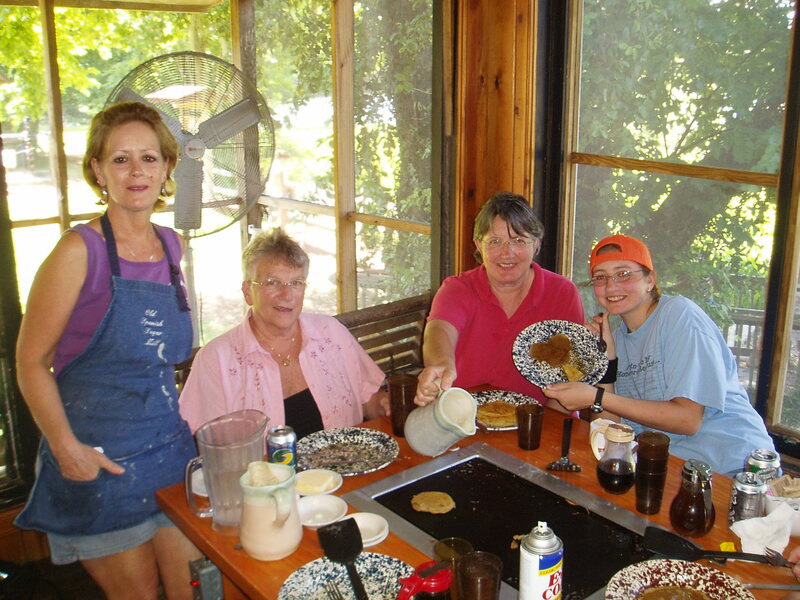 I’m ecstatic because I just discovered De Leon Springs State Park featuring a spring, a visitor’s center, an eco/history boat tour and a restaurant where you can griddle up pancakes right on your table! Unlike Wekiwa, De Leon spring features a roped off area shallow enough for youngsters, a ground level platform off which you can jump into the spring, a beautiful waterfall, a visitor’s center, an eco/history boat tour and (best of all) a restaurant right beside the spring where you can cook your own pancakes on the griddle in the middle of your table. We went to the park on Sunday. Since we were planning to eat brunch at the park, we had not eaten breakfast. As we drove through the park entrance, we were dismayed to see a sign that said the wait at the restaurant was one and a half hours! However, when we got to the restaurant the hostess told us the wait was only an hour. Less than 30 minutes later, our name was called. Perfect timing. 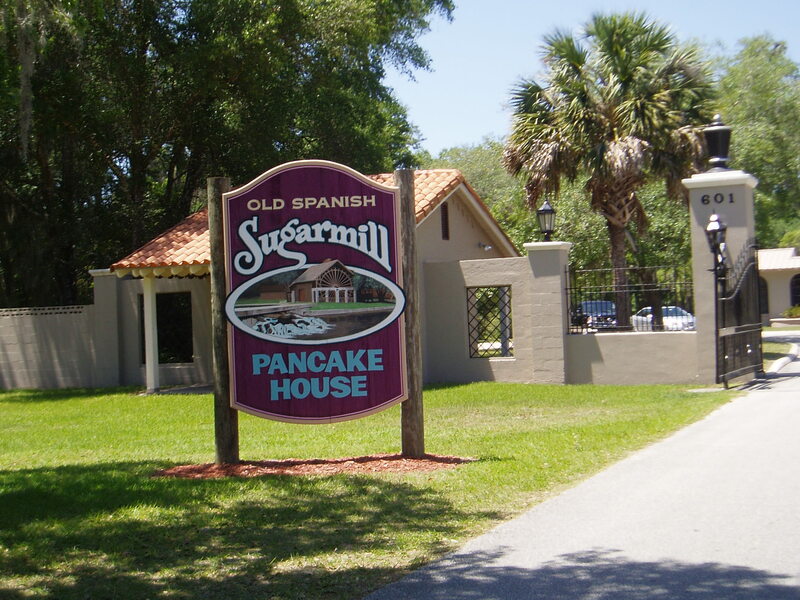 The Old Spanish Sugar Mill Restaurant is a delight–And an absolute “must see” on your Florida vacation. While some local folks like to claim the mill was built as early as 1570, most historians date it to the early 1800’s. it was destroyed and rebuilt at least twice. In 1961, the old building was scheduled for demolition to be destroyed once again but Peter and Marjorie Schwarze had other ideas. They restored the mill and created this unique restaurant. The all-you-can-eat pancake breakfast is only $4.75 per person. For $1.50 more, you can get a small bowl of pecans, cinamon apples, bananas, blueberries, peanut butter, applesauce or (my personal favorite) chocolate chips. Two beautiful, handmade pitchers are brought to the table containing stone ground pancake batter–One made with five grain flour the other with unbleached flour. The griddle in the center of the table is turned on, oil spray is applied and then you pour out the batter and add whatever extras you selected. Number One Son enjoyed making pancakes shaped to resemble Mickey Mouse. Number One Daughter enjoyed eating them! 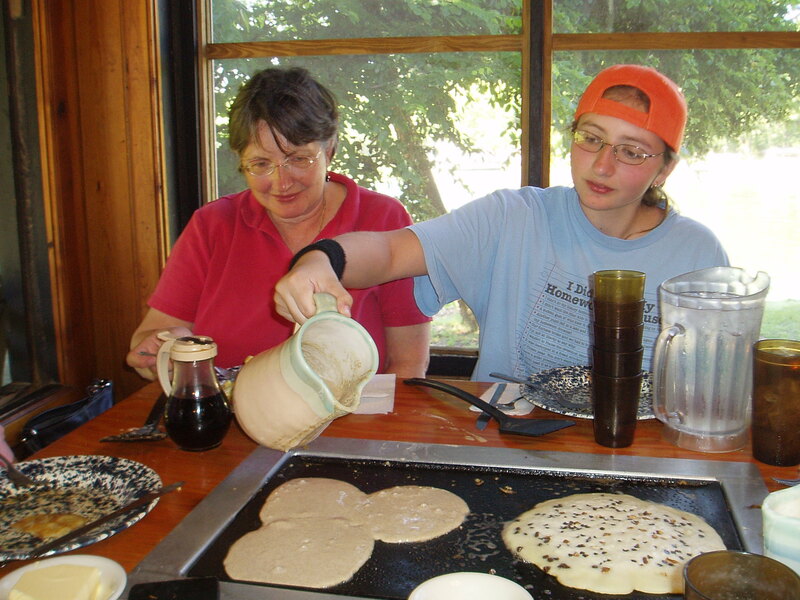 In addition to pancakes, you can also order eggs, bacon, homemade bread and even vegetarian sausage which you also cook on the griddle at your table. When I ordered eggs, I was expecting that I would get a bowl with the contents of a cracked egg. I was surprised to receive two eggs which I had to crack and pour onto the griddle myself. It was fun (once I got the shell out.) The menu also includes assorted sandwiches and side items. Ellen, our waitress, has worked at the Mill for 18 years. She was friendly, knowledgeable and very helpful. At one point, the griddle at our table stopped working and she immediately provided a new thermostat and got it functional. She even posed for some pictures for this blog. The park has a visitor’s center right beside the spring with lots of great information. Also available at the park is an eco/history boat tour. From the mill, you walk across a bridge with the spring to your right and a small waterfall to your left where the spring empties into the Spring Garden Run. You then come to the boat dock where the Fountain of Youth eco/history boat tour begins. It lasts 50 minutes and costs only $12. We arrived at the park too late to take advantage of this tour but it looked like a wonderful experience. We will find out because this is one place we plan to return to–Often! Ponce de Leon may have never discovered the fountain of youth, but we all felt younger and rejuvenated after our visit to De Leon Springs State Park. This entry was posted on April 27, 2010 at 7:15 pm and is filed under Must See/Must Do. You can follow any responses to this entry through the RSS 2.0 feed. You can leave a response, or trackback from your own site. The Sugar Mill gang is delighted you and your family had such fun during your day at De Leon Springs. It really is an exquisite spot and we always feel we’ve done our jobs well when our visitors want to tell others of their “discovery”. Just remember, when you’re trying to find us, that De Leon Springs (as we are known in state park circles) is in central Florida (about an hour north of Orlando). There is another Ponce De Leon Springs State Park in the panhandle. 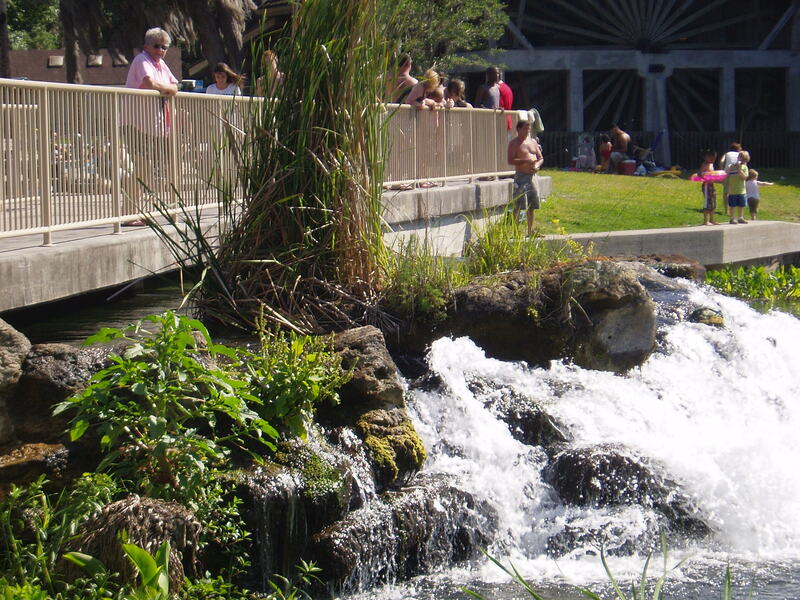 While that’s a lovely spot, as well, you’ll have to come to De Leon Springs to have pancakes and a dip in the legendary Fountain of Youth. I was glad to see that you liked De Leon over Wekiwa because I had already decided we couldn’t do both, but I am curious if you have any thoughts on whether or not we should also stop at Blue Springs State Park or if De Leon will be plenty. We’ll be passing by Blue Springs on our way from De Leon to the Orlando area in mid-April… I’m going to scour your blog for ideas now! Thanks again!